In June 2017 the Department of Health and Human Services established a new Language Services Innovation Grant program to improve the capacity of public hospitals to provide language services in acute settings in Victoria. The aim of this program is to increase uptake of interpreters in hospitals, with a particular focus on the needs of people from refugee backgrounds including people seeking asylum. This grants program is specifically for the development of innovative projects rather than a simple increase in already existing language services. There is initial funding for four-two-year projects (2017 – 2019) with an anticipated further three projects to be funded from 2019 – 2021. Goulburn Valley Health – It’s an emergency! Language Service Provision in the ED. Melbourne Health – Improving access to professional interpreters using videoconferencing. 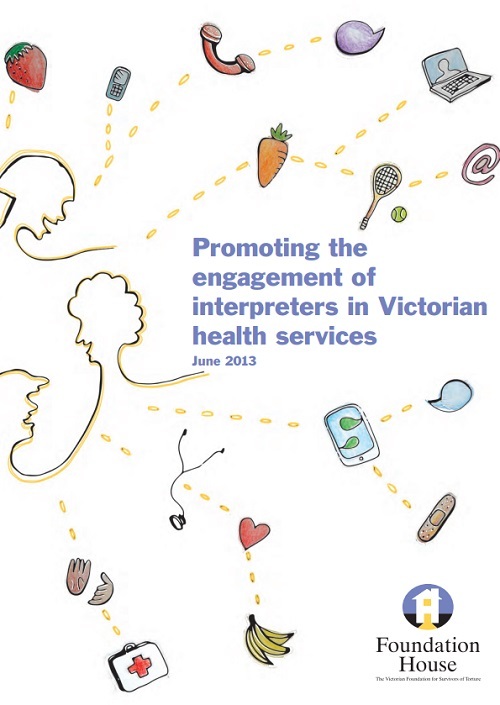 The Victorian Refugee Health Network and Foundation House identified that health care practitioners often provide services to clients of a low English proficiency, without engaging qualified interpreters. Late in 2011 Foundation House commenced a project investigating the barriers and facilitators to engaging qualified interpreters in health. Preliminary findings were considered at a meeting in April 2012 which was attended by health practitioners and representatives of the Australian and Victorian governments, specialist colleges and health services. A discussion paper was released in May 2012 and distributed to key stakeholders seeking submissions. Over thirty responses were received from health practitioners, government, specialist colleges, hospitals, community health centres and peak bodies. The full report Promoting the engagement of interpreters in Victorian health services was published in June 2013.